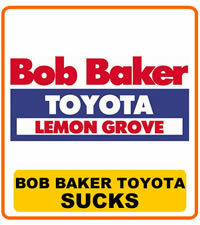 my problem with toyota is that i have gone to the same dealer in lemon grove ca and 3 times i turned in a car early and had it paid off then put a very large down payment on a new lease only to find out that i was entitled to the remainder of my service agreement and gap insurance fee that i paid in full for the entire course of the lease. it took a dealer from infiniti to tell me that i could cancel the contract for my gap insurance and service agreement and get whatever percentage was left. I'm a person who likes to get anew car every couple of years. the downside is that i have to put a very large downpayment but over the course of seven years i paid for 16 years of gap and service insurance. and after telling the finance mgr this when my last toyota was paid off in full 2 years early he still had the nerve to tell me that there is no guarantee that i will get the remainder of my money which was 28 percent of the contract i was entitled to. i calculated what i paid and it comes out to more than 300.00 that i am owed. i cancelled this contract 3 months ago and still havent seen my money i guess now i am going to have to go back to the dealership and make a big scene or file a small claims lawsuit against toyota. normally i might let something like this go but this is 3 cars that screwed me over on. oh well hopefully they will show some kind of professionalism and correct this situation but i am not going to hold my breath.